Tandem is a SaaS platform built to help eCommerce companies better understand their customers using sales data, surveys and behavioral metrics. All work done by Lee Waters while working as Lead Product Designer at Tandem from 2013-2015. The Tandem NPS dashboard displays results from a one question survey. "How likely are you to refer us to a friend?" is asked to every customer via email after a purchase. Over time, the results of that survey make up the Net Promoter Score, and that is what is displayed here. From here, the user can monitor the NPS score and reply to comments in real time. Another core feature of the Tandem app was bucketing customers of an eCommerce store into persona groups based on behavioral metrics. This dashboard allowed the user to create filters from select groups of customers and send them a custom survey directly from the app. 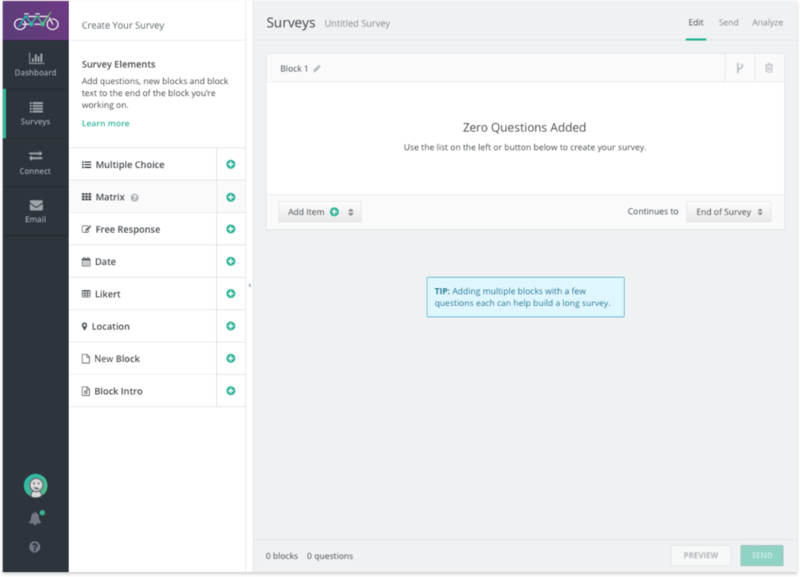 Tandem featured a survey builder that made it easy to create, send and analyze results of surveys. In addition to multiple question types, the survey builder also had advanced logic to conditionally hide and skip certain parts of the survey. Cohort analysis allows the user to filter respondants into a group based on certain answers. In the example shown, a cohort is being created for respondants who answered “Star Trek” in question 1, and “Reddit” in question 2.